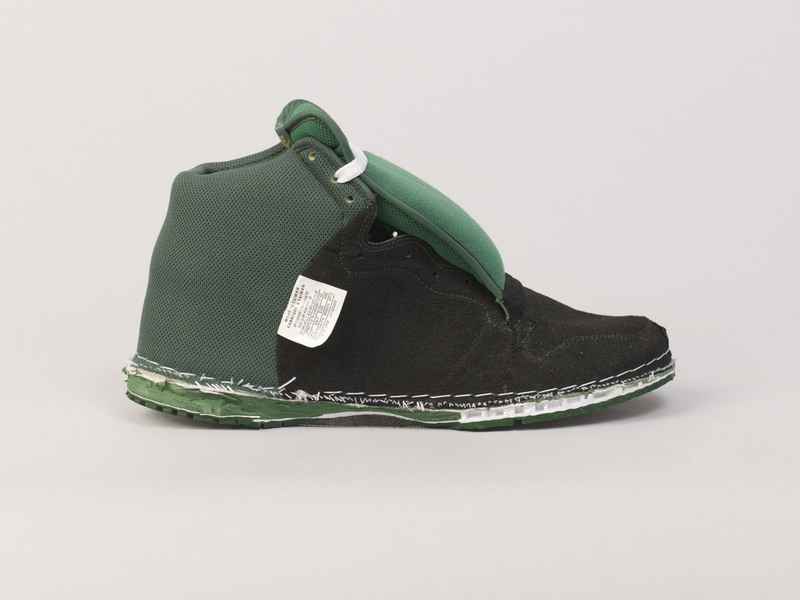 In the Projects 11”x17” & Invert Footwear, designer, artists and researcher Elisa Van Joolen de/re-constructs mass-produced clothing questioning notions of production and value consumers often take for granted. As brands overlap in forced dialogue, Van Joolen re-presents and defines the aesthetic and hierarchal identity of brands proposing new methods for approaching the fabrication of basics and luxury items alike. N|A: How did the 11”x17” project begin? Elisa Van Joolen: I initiated 11”x17” in New York in 2012. At the beginning of 2013—when I moved back to Amsterdam—I started contacting different labels located in the Netherlands by email requesting garment and footwear donations. I explained briefly what I intended to do, which was to reuse a selection of the donated pieces, combine them with different brands and make them into 11”x17” sweatshirts and another project called Invert Footwear. I explained that the intention of this project was to bring together different layers of production and value from the fashion industry. 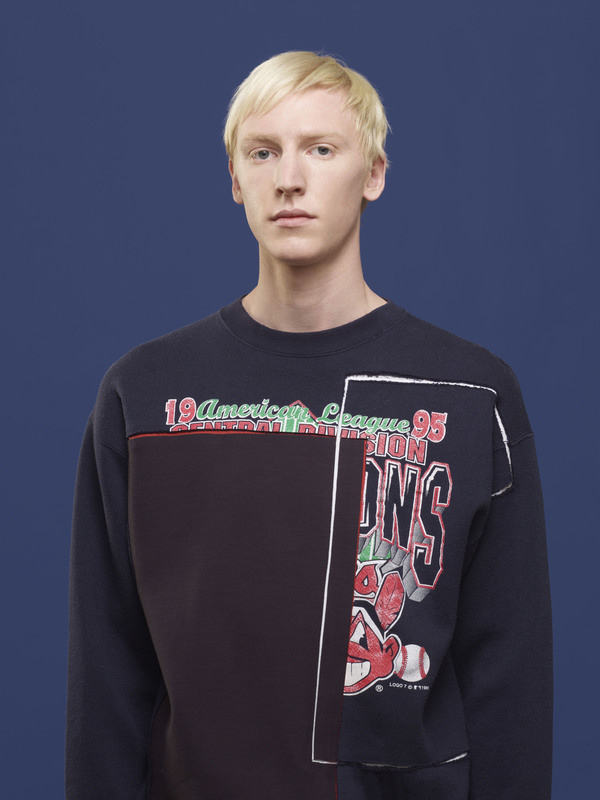 N|A: In inverting the shoe and re-configuring the sweatshirt you bring out an unintended aesthetic which both compliments and subverts the original construction. What is your process for designing this work? EVJ: The aesthetics of the project are not ‘designed’ as such; they are the outcome of the procedures that I use to re-configure the items. The sweaters I make are all made with the same procedure. Which is: I cut 11 by 17 inch, tabloid size, pieces out of a sweater and swap those pieces with other sweaters. I do not draw or sketch beforehand, the cuttings in the sweaters define the shape, fit and look of the final sweater. For me it doesn’t matter if it a Kenzo sweater of Gap sweater I ‘treat’ them the same. N|A: This almost makes it like an Exquisite Corpse or some other ideas of subliminal dialogue. A lot of what this project highlights is a process of collaboration we don’t usually think about. How is the idea of exchange important to understanding 11”x17” and Invert Footwear? EVJ: The ‘original donated garments’ represent on the one hand the outcome of the many conversations I had with representatives from different brands, and on the other hand the starting material (=fabric) for new assemblages: new sweaters and footwear. N|A: The basis of the work is so highly conceptual even as it is totally presenting a do you consider yourself a designer or something else somewhere between design/theory? EVJ: I always find being called a designer a bit problematic because I am not really looking for straight solutions. I pose questions. I see 11"x17" not solely as a critique of the fashion industry, but rather as a way to draw together diverse components. It is a proposition. So, I would describe myself as an editor, someone who specifically combines material and makes new compositions. N|A: So, do you then see these pieces as functional or as art objects? EVJ: I see the sweaters on the one hand as functional objects; I love it when people wear them. 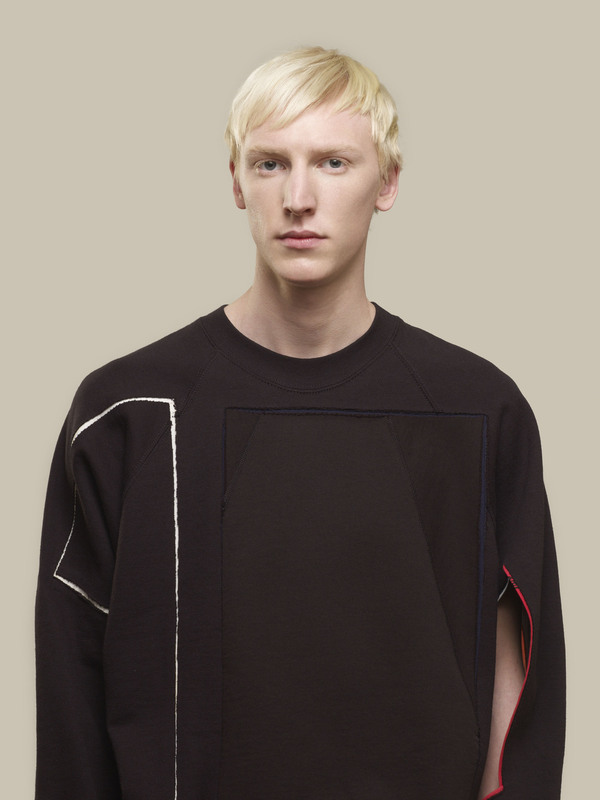 On the other hand, I see the sweaters as theoretical objects: they pose questions and allow for critical reflection. Perhaps you could call them ‘conversation pieces’. N|A: This idea of mix-matched, high/low, expectations is really prevalent in fashion since at least the early 1990’s, but what you’re suggesting is something a bit more deceptively radical. EVJ: If you open a fashion magazine this is already advertised as ‘mix and match’. But actually this never happens within one piece of clothing. It is always the second-hand, less valuable, paired with a designer piece. Why is there not a mix within one item? That is what I am investigating with 11”x17”. I combine different categories from the entire scope of fashion into one piece of clothing. I want to create this kind of plural connection between brands. N|A: And this plural connection isn’t only about an aesthetic surface but also examines a hierarchal structure between ideas of luxury and functionality and methods of production? EVJ: Wearing outfits without hierarchic distinctions between for example second-hand and high-end fits into today’s zeitgeist. Just like the way we use the Internet; everything exists next to each other. You could see this as a new concept of productivity: to reuse, sample and mix existing cultural expressions. It is almost like pushing the ‘shuffle’ button while playing music; you get a new, unforeseen order of songs. In my case I shuffle these relations and make a new fluid order - perhaps rhizomatic is the right term. N|A: How is the hidden language of factory workers in constructing the original garment explored in the objects you make? 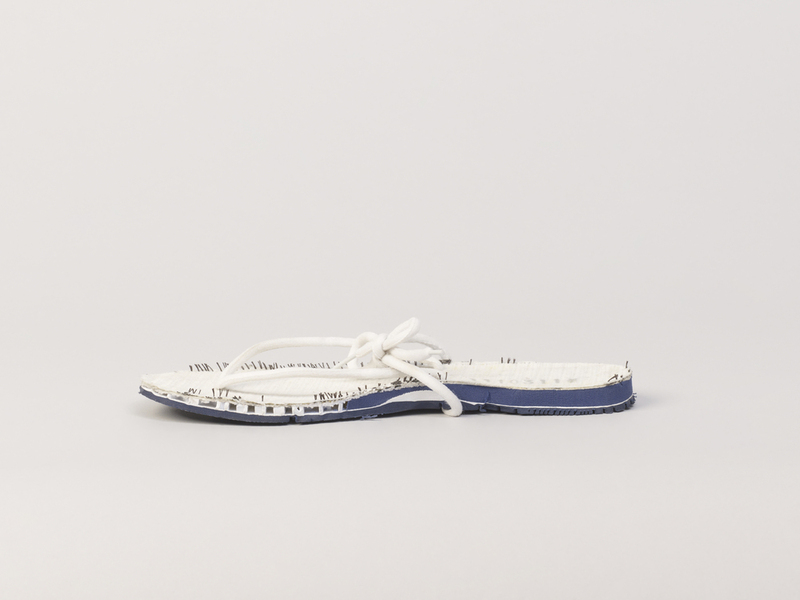 EVJ: With regards to Invert Footwear: I turn the sneakers literally inside out and make new soles out of one-dollar flip-flops, while using the soles of the sneakers to create new sandals. The inversion process allows the stitch lines that are normally hidden within the shoes to emerge. These are the marks of factory workers—working in Vietnam, in Taiwan—and their presence in the production process is brought to the fore. The new incarnation emphasizes the handwork that is part of these shoes as well de-emphasizing their mass-produced elements. It raises the questions: What makes one piece of clothing or footwear ‘hand-made’ as opposed to another? And why is one more valuable than the other? The handwork of the workers is not only literally laid bare it is also the hierarchical relationship between the brand and the contract workers that is inverted. It is the authority of the brand that conventionally obscures the role of the workers. N|A: By and large, corporate fashion—especially as it is connected to the “on-demand” digital economy of desire—would really rather we didn’t think about who exactly makes our clothes. The project both acknowledges the hierarchical and exploitative relations between different players in these networks and proposes that these seemingly fixed relations can be re-ordered. N|A: Can you speak more about the relationship of value in your work both as inverted/re-made art-objects and as consumer products? EVJ: If you really think about it a ‘basic’ piece of clothing, any piece is already a collaboration in itself. It is designed by one person and then the sketch is sent, for example, to Vietnam, where one part is produced and then shipped to China where the buttons are put on, then it is shipped back to Europe and put in a store, so there is already a lot of collaboration within any piece of clothing. With this project I intend to ‘open up’ ideas connected to value systems of the fashion industry. Why is a G-Star sweater worth more than an H&M sweater? Often garments from different brands are made in the same factory… What does that say about the value of a garment? Value is constantly shifting, it is very much dependent on context. Everyone has a different idea of what makes something valuable. It is impossible to fix it, it is not static. N|A: Is this an antagonistic relationship you’re engaged in with the fashion industry? EVJ: Not at all. I engage PR employees/designers from different brands in conversation and we talk about that. I like to emphasize that I like to work with, rather than against these brands. We have seen a lot of anti-fashion design or art in the past years, but it doesn’t lead us anywhere… I believe that a way forward is to find new ways to work together. N|A: Leftover, “slightly imperfect” and prototypes are often “recycled” in the developing world where a completely different hidden language of brands emerges, is this something you consider? EVJ: It is fascinating to see what happens to our discarded clothing; the clothing we give away to charity. One would think that there is no money involved – it just helps people. Actually: the contrary is true. The BBC documentary: The Secret Life of Your Clothes, by Ade Adepitan, nicely portrays this. Ade literally follows clothing donated to charity in the UK, he tracks down the clothing to Ghana, and shows that our leftovers are a huge business! That intrigues me, and yes perhaps that could be something to explore further in the future. N|A: In what way is your work focused on ideas of recycling and waste? EVJ: I always brings to afore that the ‘products’ I make are a result of conversations I had with different representatives from diverse fashion companies. I specifically name the parts of which an 11”x17” Sweater consist out of (for instance a navy Tultex sweatshirt (1995) combined with a navy sweatshirt from moniquevanheist (AW 2012 / 2013). 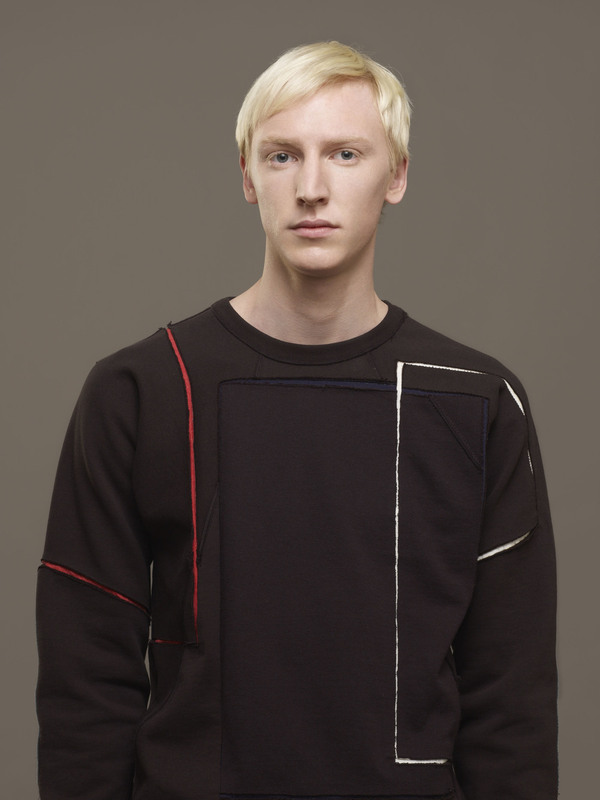 The lining of the sweater consists of strips of a red G-Star t-shirt (2013) and a white Union Made t-shirt (date unknown). I feel we need to be specific and precise, especially in a time where everything is available to us. Ideas of recycling and waste are for me not only linked to materials. Rather in finding new ways on how to work together, how to collaborate.